I was so honoured to be invited to be the very first speaker at a local women’s networking event at the beginning of March. The event is called Dinner & Inspiration, and it’s hosted by the truly lovely Elizabeth Rankich. 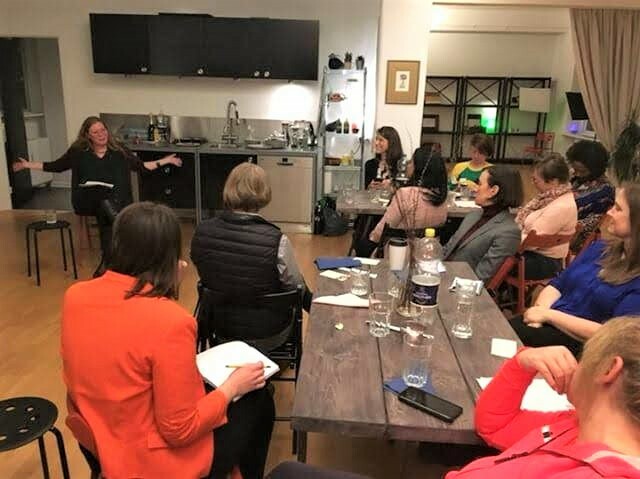 Usually an intimate dinner for 8-10 people, this event ended up being 25 glorious female entrepreneurs, who had all turned up to hear me deliver my Art of Connection workshop. It was my first time running this workshop in real life, and whilst I actually love delivering workshops and speaking in front of people, I always get The Fear beforehand! On top of the jitters, I also woke up the morning of the talk feeling very unwell, with my chronic illness deciding that it would be a really good day to act up. However, not one to be deterred by something as trifling as illness, I took along a full script of the workshop to counteract my foggy brain, and delivered the whole talk sitting in a chair so I wouldn’t be overwhelmed with fatigue. Fortunately, everyone was lovely and accommodated my needs effortlessly so I was still able to deliver the workshop and share some kickass connection tips and tricks with the group (phew!). Now, as you will know if you’ve spent any time here before, I am all about online connection (in fact, that was the subject of my workshop!). I think the internet is a phenomenal tool for those of us who are introverted, shy, scared of being visible, socially anxious, or have health conditions (physical or mental or both) that prevent us from being able to get out and about. However, there is still a lot to be said for the energy that comes from being in a room full of like-minded people IRL. It was buzzing! I got to speak with (and hug) some incredible, interesting women, and by the time the event ended I was completely exhausted but I also felt about 12 feet tall! It was a truly wonderful evening, and I’m really looking forward to the next event. Huge thanks go to Elizabeth, for bringing together such a wonderful group, for the lovely pressies she gave me afterwards, and for inviting me to speak. She made me feel like a rock star! Thank you to everyone who came out on a dark and rainy night to see me speak, for being so engaged and enthusiastic, and for all your wonderful comments afterwards. Also thanks have to go to the wonderful venue W.E. Space who have created the most beautiful, cosy environment for events like this. If you’re in Copenhagen, it’s well worth popping for one of their free coffee & a workshop events on Tuesday mornings. Natalya and Violetta, who run the space, are so warm and welcoming - I felt right at home. And finally, thanks to Cake Creations for the most amazing chocolate cake to round off the evening! If you’re interested in booking me to run a workshop, either in real life or online (for a membership group, for example), then please do get in touch. I have a selection of existing workshops to choose from, or I can create one just for you.